Skip the freezer section and make homemade broccoli with cheese sauce instead! 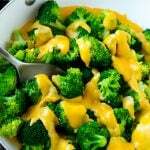 Steamed broccoli florets are smothered in an easy 3 ingredient cheese sauce for a delicious and kid friendly side dish. Add the cheese and corn starch to a bowl and toss to combine. Place the cheese mixture and evaporated milk in a sauce pan over low heat. Cook, stirring occasionally, until cheese has melted and sauce is smooth and thick. Add additional evaporated milk if needed to thin the sauce. Season the broccoli with salt and pepper to taste. Pour the cheese sauce over the broccoli and serve.